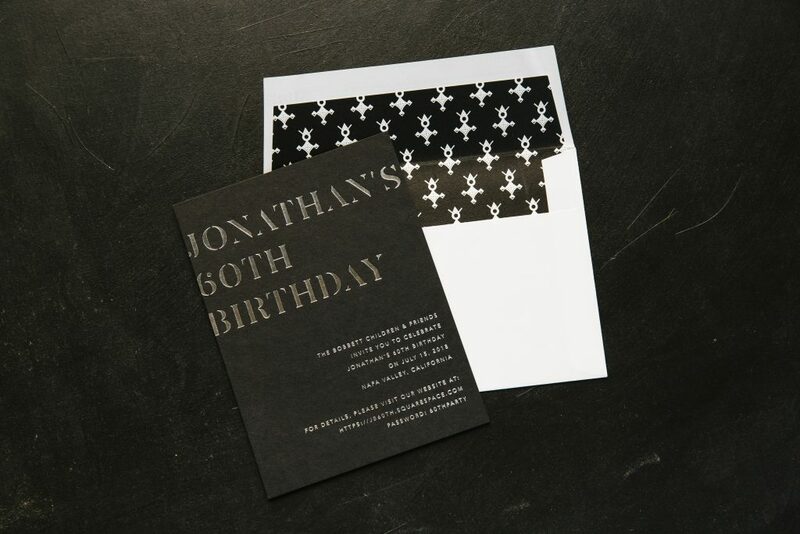 Jonathan’s silver foil 60th birthday invitations set the tone for a celebration to come. Hosted by his family and friends, this set inspired by our Alchemy design. It came together thanks to the help of our friends at Gus and Ruby. 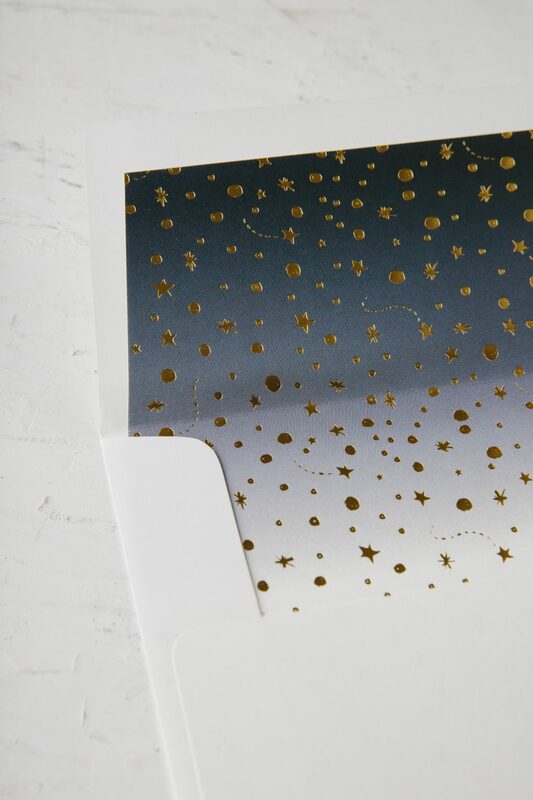 Our Bella Black paper created a contrasting backdrop to the Silver Shine foil printed on both sides. 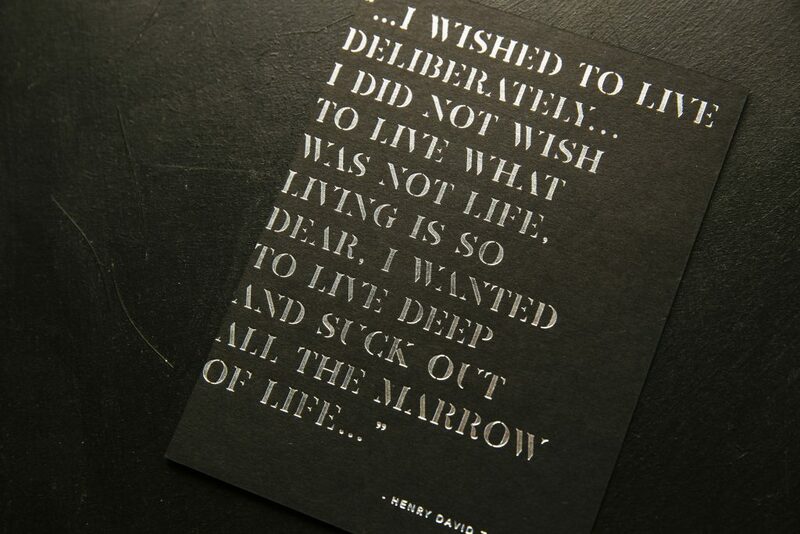 On the reverse, guests will find a Henry David Thoreau quote that captures what it means to live. Finally, we create a custom pattern to add a graphic pop to this otherwise type based set. 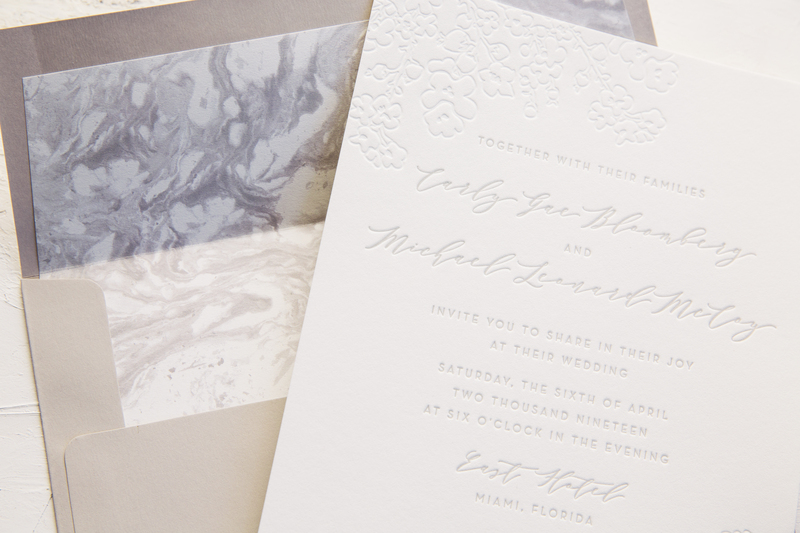 Our friends at Wynwood Letterpress helped us bring these subtle floral letterpress wedding invitations to life. The suite kept a monochromatic color palette. 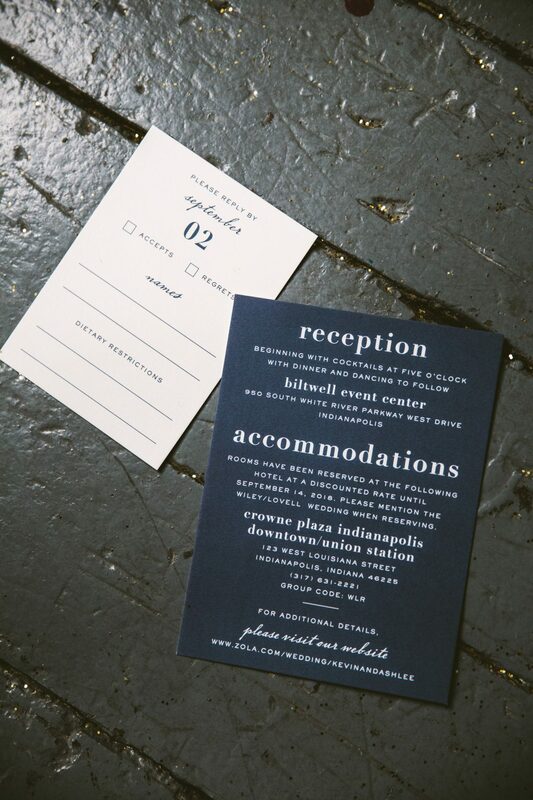 They used our Bella Light Gray paper for their envelopes as well as Fog letterpress for the typography. 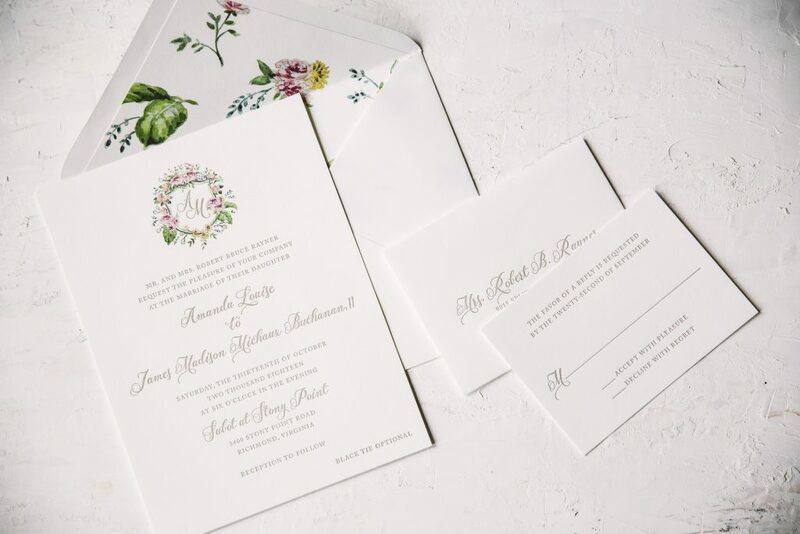 Blind debossed drawings of florals anchored the top left as well as the bottom right of the invitation. An envelope liner in our Marble 4 pattern added an unexpected contemporary twist to a floral forward set. 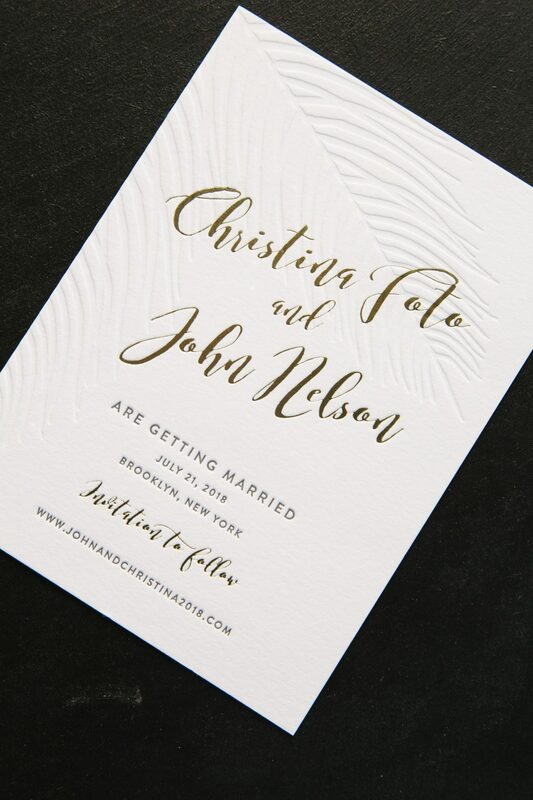 Christina and John created their tropical foil save the dates with the help of our Bella Figura store in Manhattan. 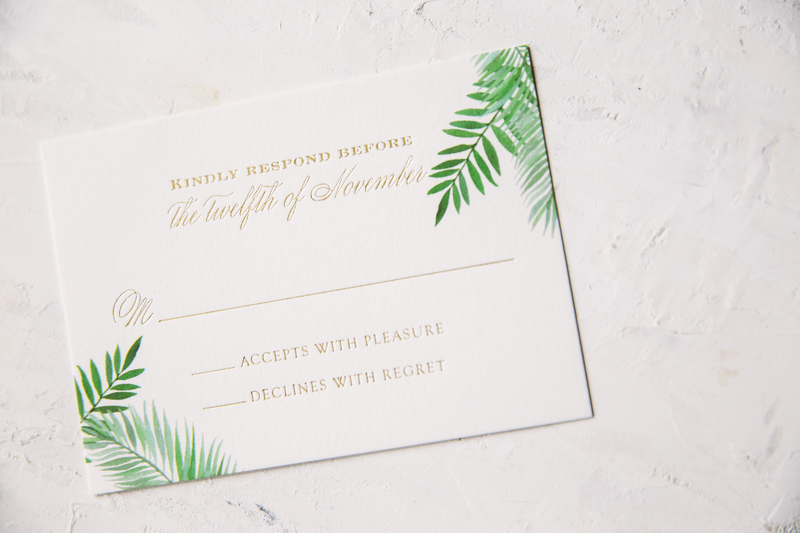 Inspired by our Lani design, these save the dates set a tropical tone for their wedding to come. 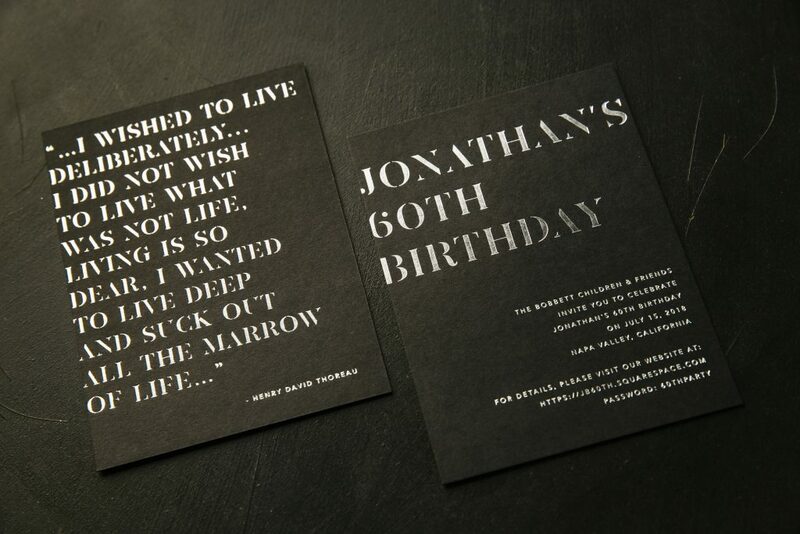 Typography in Tawny Matte foil added a subtle metallic accent to the blind debossed palm. 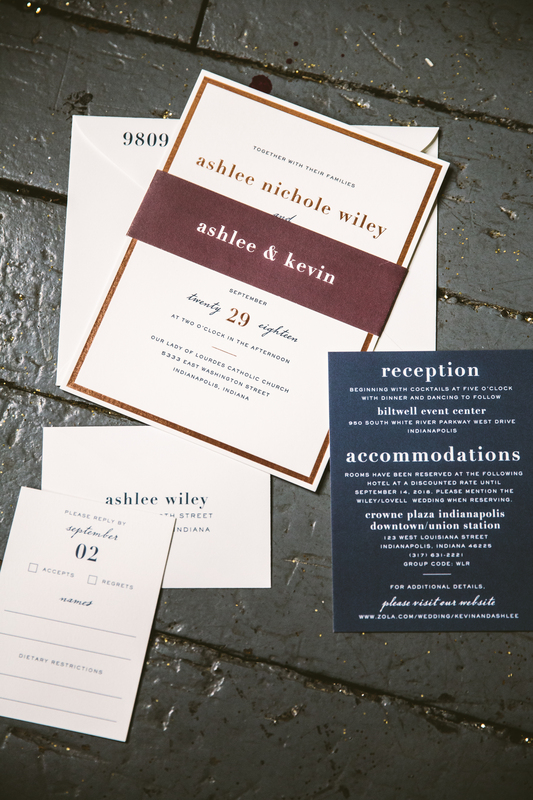 Additionally, charcoal letterpress kept the color palette neutral for the block type. Finally, the envelope liner tied the tropical theme of this set together. 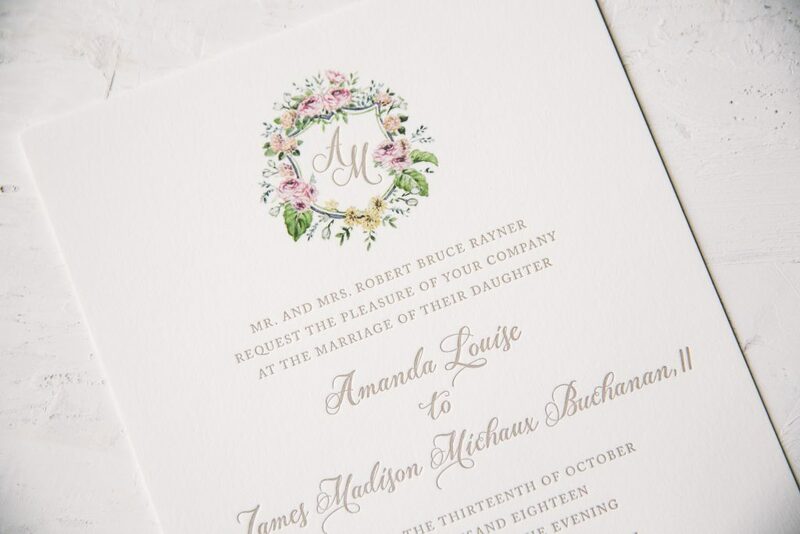 We worked with Sue Corral Ink to create these neutral letterpress wedding invitations with floral accents for Amanda and James. They opted for a Desert letterpress ink color which they carried through to the reply set as well. 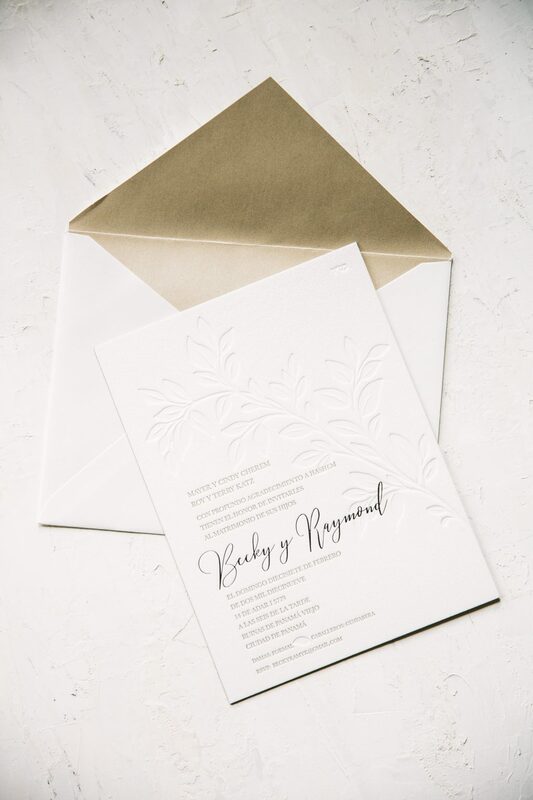 The neutral palette allowed for a pop of color on the invitation as well as the envelope liner. They dressed up the monogram with florals around the perimeter of the cartouche. 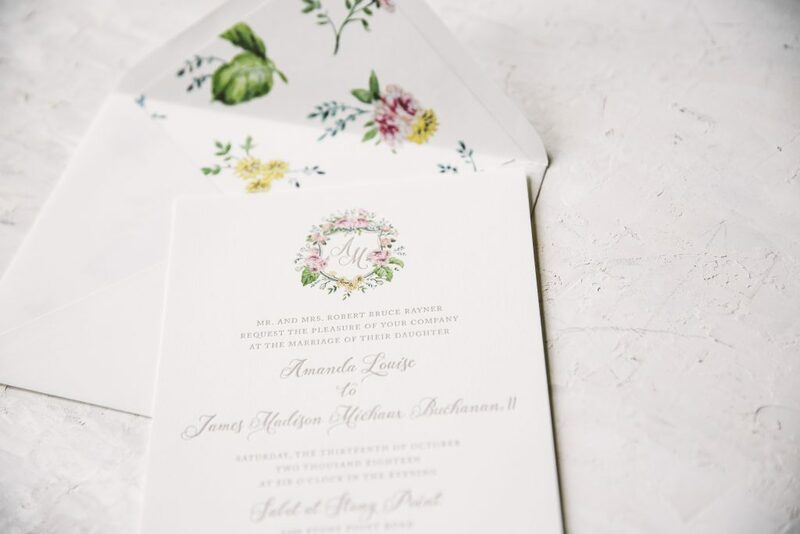 Lastly, the same floral theme carried onto the envelope liner kept everything consistent and harmonious. 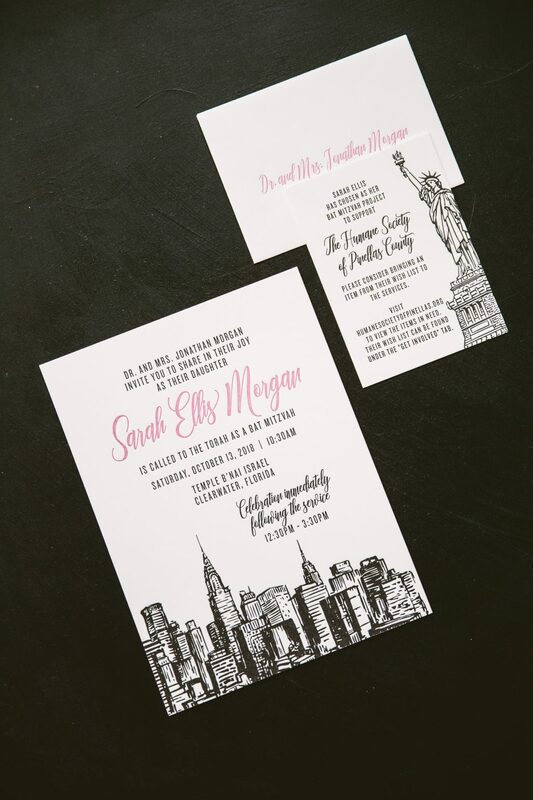 We worked with Urban Coast who helped us create Sarah’s fuchsia and black letterpress Bat Mitzvah invitations. They used the big apple as their inspiration for this set. 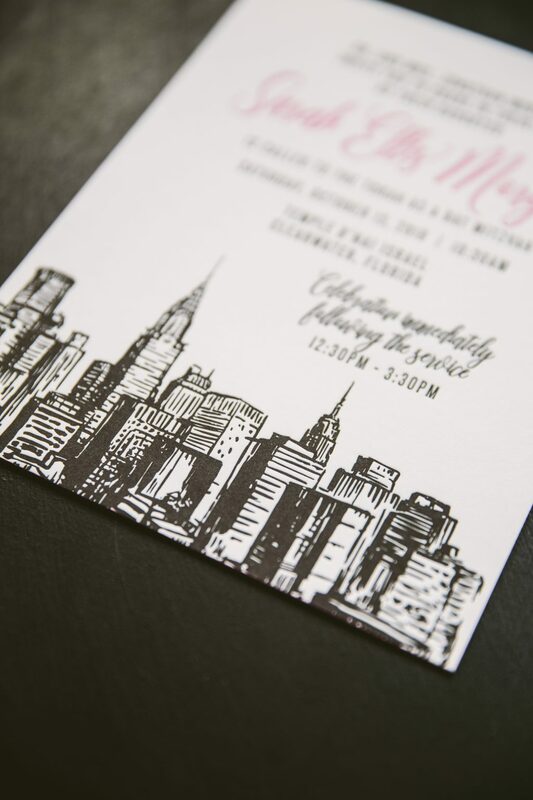 A sketchy skyline printed at the bottom of the invitation added playful interest. Sarah’s name in Fuchsia kept the invitation youthful as well as a feminine touch. 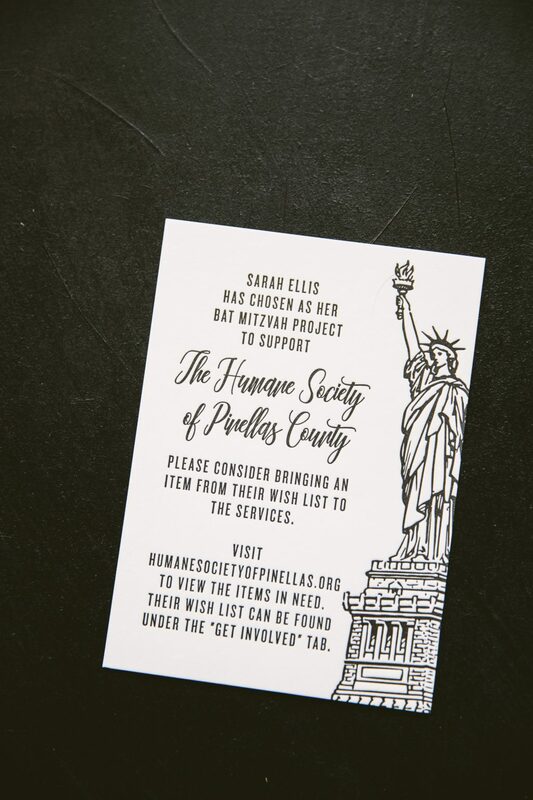 A donation card with the statue of liberty pictured in the right to keep with the New York theme. We have no doubt everyone started spreading the news about her big day once they received their sets in the mail! 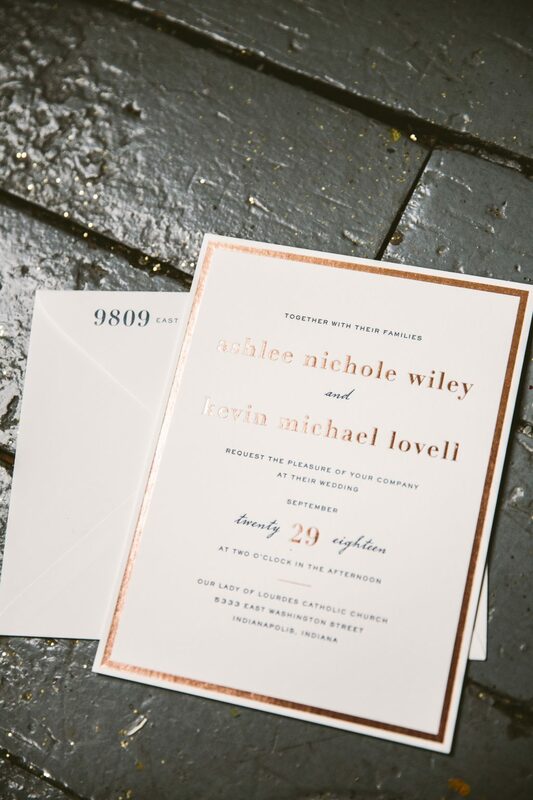 Ashlee and Kevin envisioned rose gold wedding invitations and that is exactly what Oliver’s Twist helped us bring to life. Inspired by Maeve, the couple made this design their own by adding a border in Rose Gold Shine. They used a flood of Navy ink for the insert card so that the letters popped off the page. The reply set they kept consistent in Navy as well to match the rest of the set. The couple decided to add a belly-band in Marsala to keep everything organized in one place. 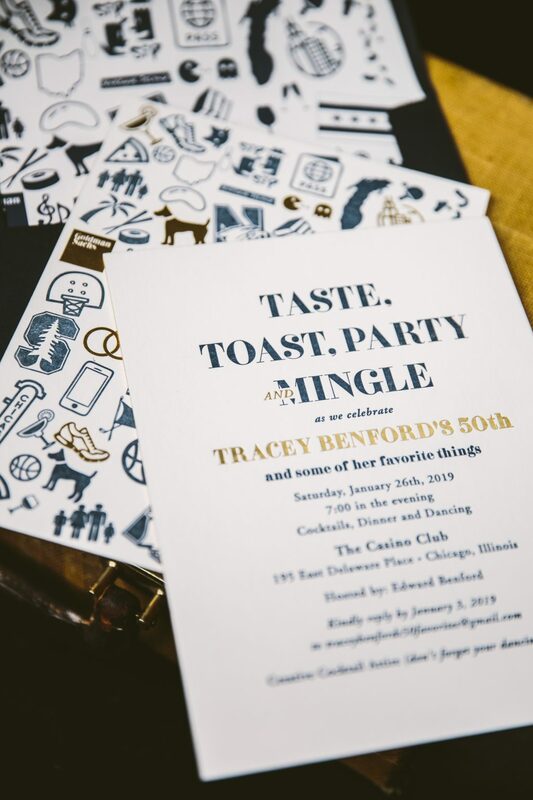 We worked with Shindig Paperie to create these tropical gold foil wedding invitations for Courtney and Blake’s big day. 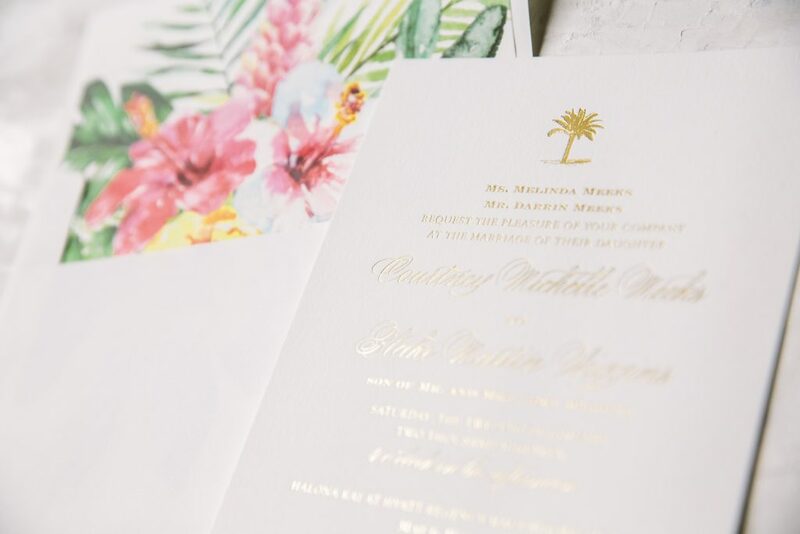 With a wedding backdrop of Hawaii, we couldn’t imagine a better fit design-wise than our Palmetto design. 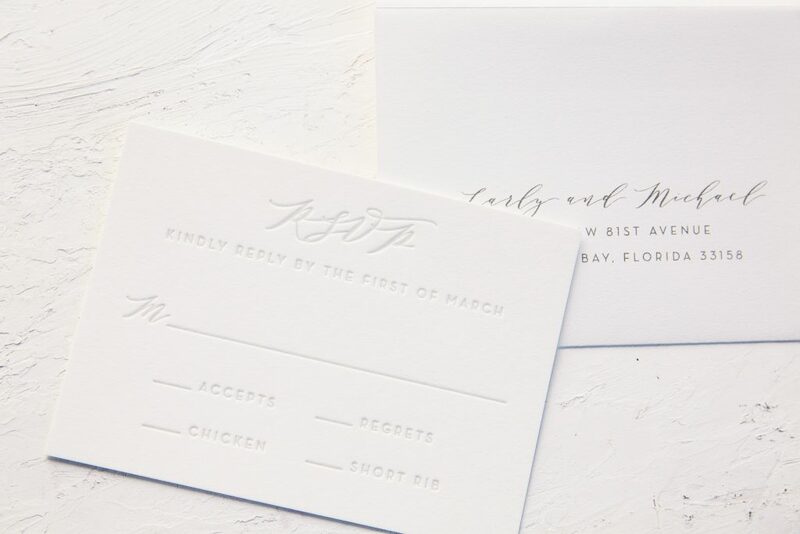 The couple customized the design by adding watercolor accents to the reply card as well as the envelope liner. 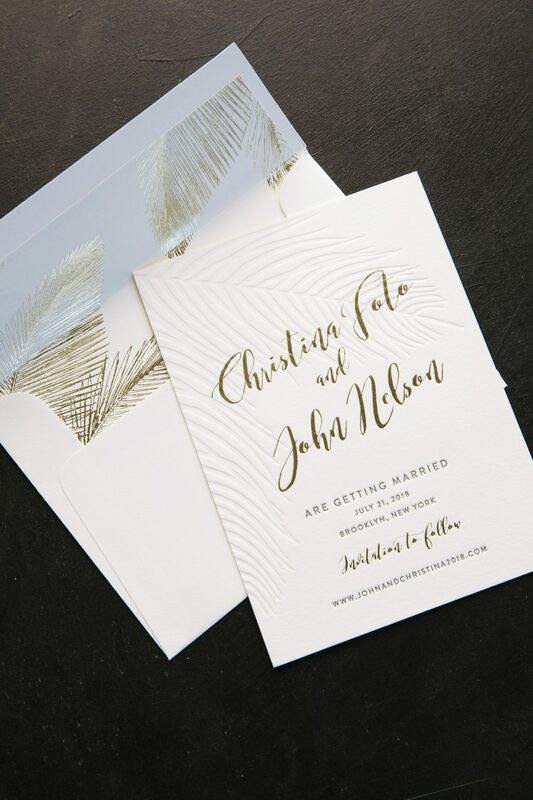 The entire invitation printed in Gold Matte foil kept the design classic yet still contained a nod to Hawaii with the palm motif at the top. 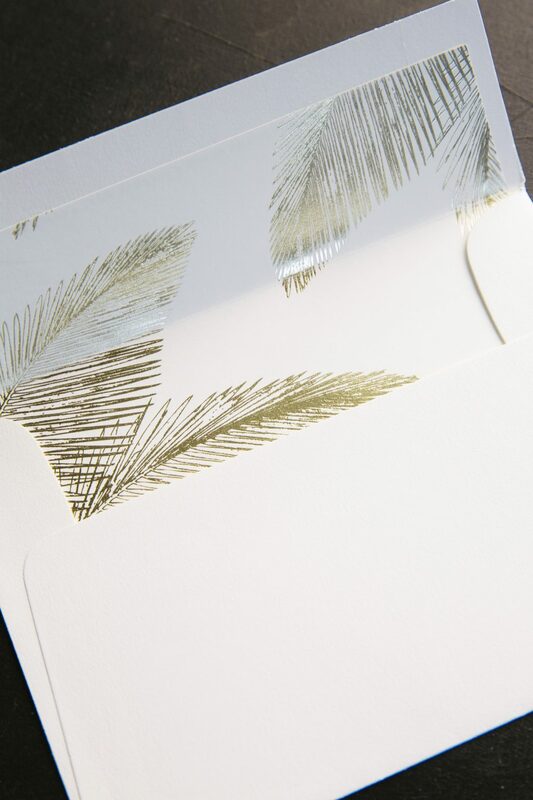 Watercolor green palm motifs on the reply card added a touch of color to this otherwise gold set. 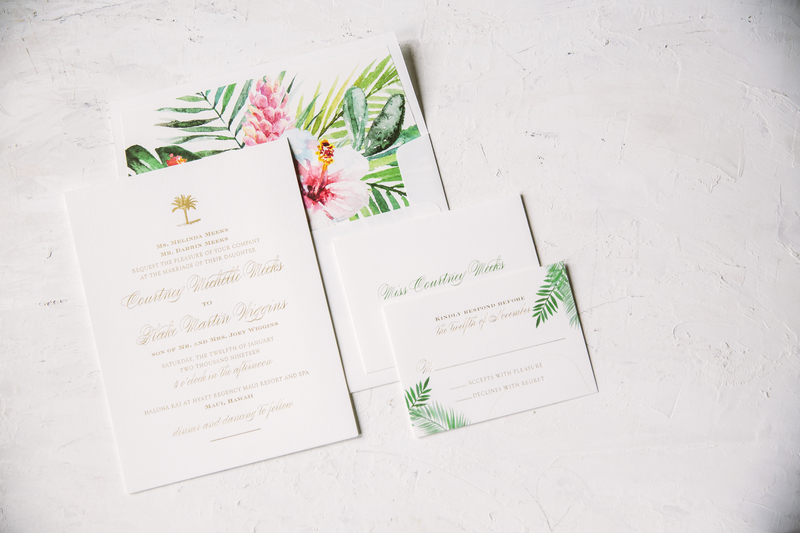 Finally, the custom envelope liner gave this suite a splash of tropical colors to tie everything together. 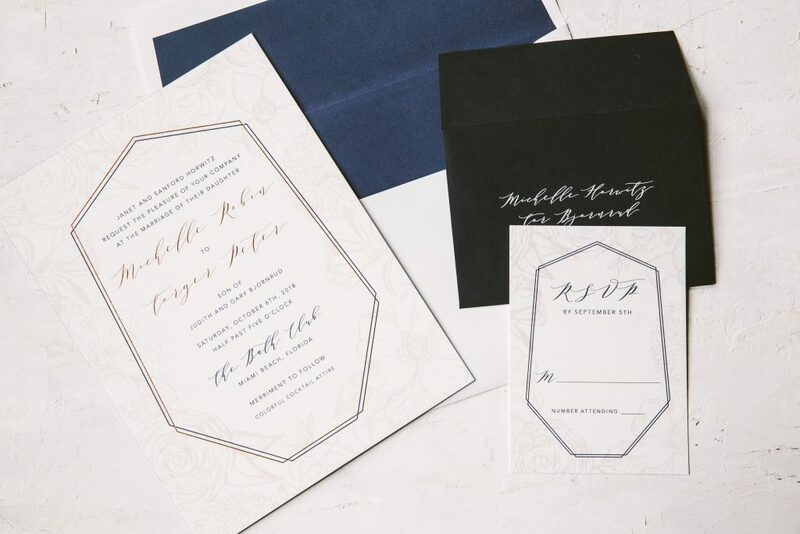 Michelle and Torger worked with Pulp and Ink who helped us bring their vision of a floral blush and navy wedding invitation to life. They paired the floral pattern with a geometric border around the perimeter of the typography. 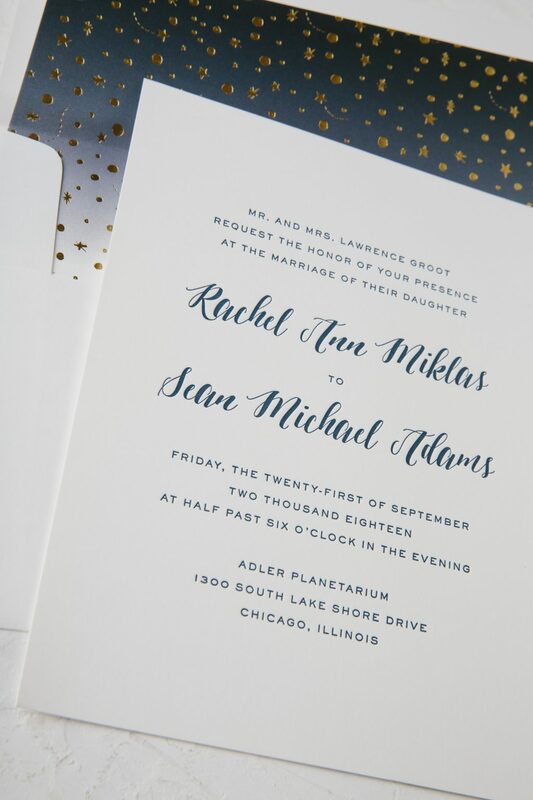 Rose Gold Shine foil accents on the border and bride and groom’s names added a metallic accent to the set. They kept the reply card consistent with the rest of the suite. 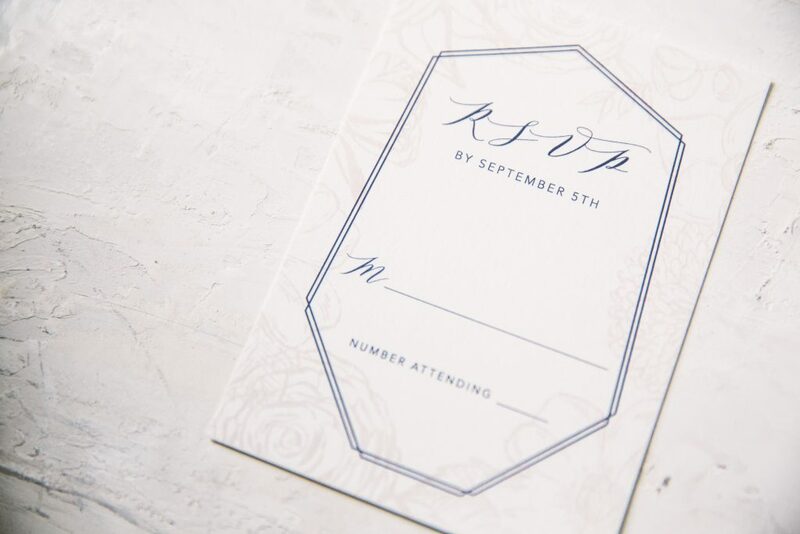 A Bella Blue reply envelope added another pop of color. Finally, they tied everything together with an envelope liner in navy. 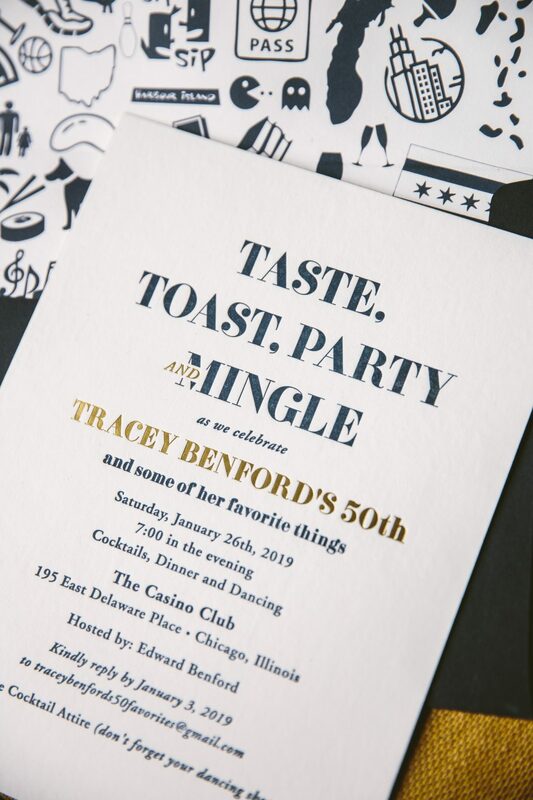 Pulp and Ink helped us to create these navy and gold foil birthday invitations for Tracey’s 50th birthday. Using navy letterpress as a base, they brought in names as well as other important elements in gold matte foil for emphasis. The couple chose to pair a text-only front with a custom pattern on the back to add a playful spin to this look. 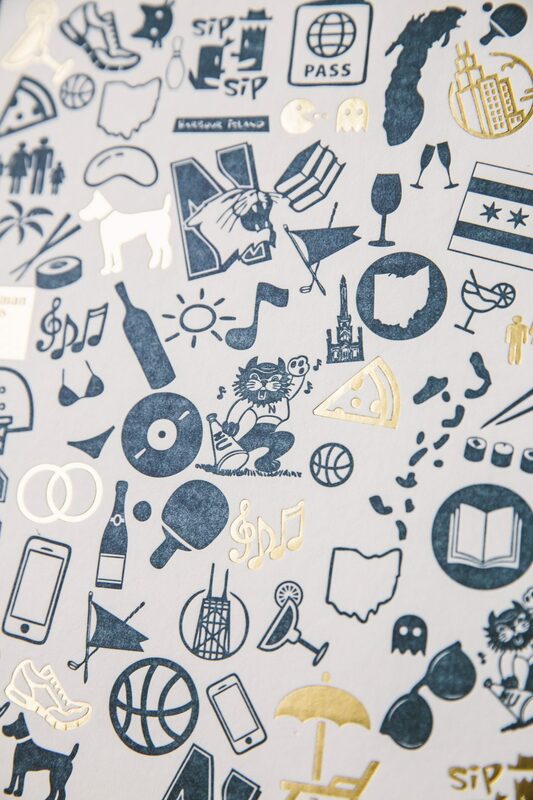 Finally, a gold matte foil edge tied the color scheme together. 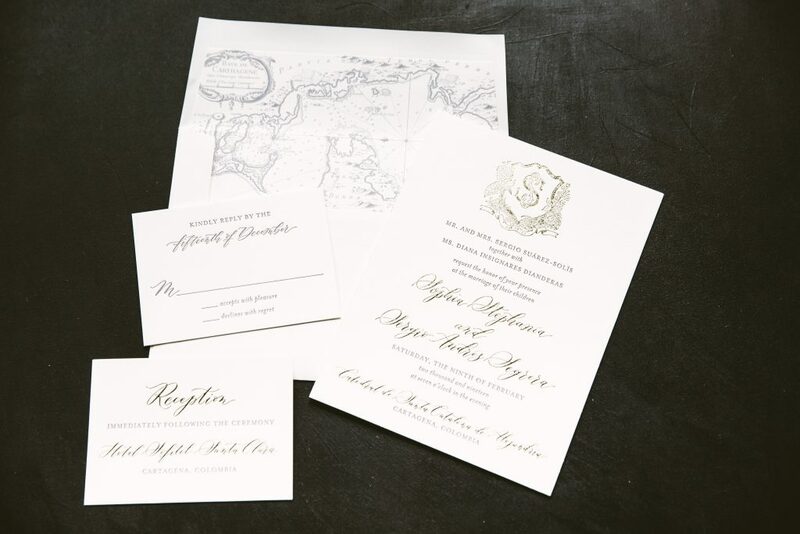 Sophia and Sergio worked with Fete Collection to create these tawny foil wedding invitations. 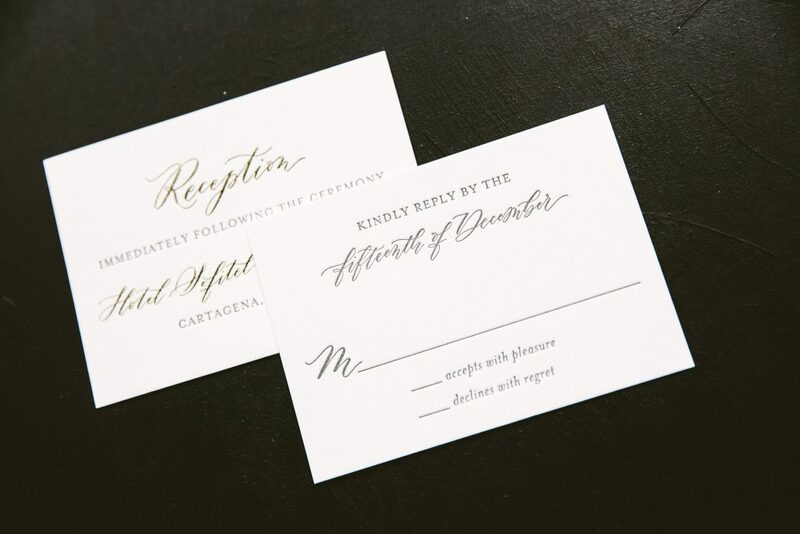 The set featured Evelina style hand calligraphy. 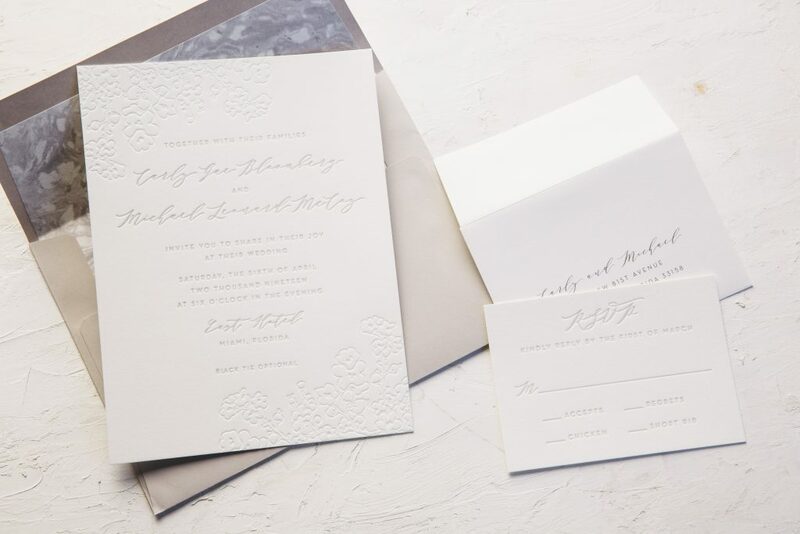 They paired tawny foil and pewter letterpress with a tawny foil edge to create an overall neutral palette. The couple created this suite their own with nods to their venue in Columbia in mind. Finally, a custom map liner in pewter brought the set together. 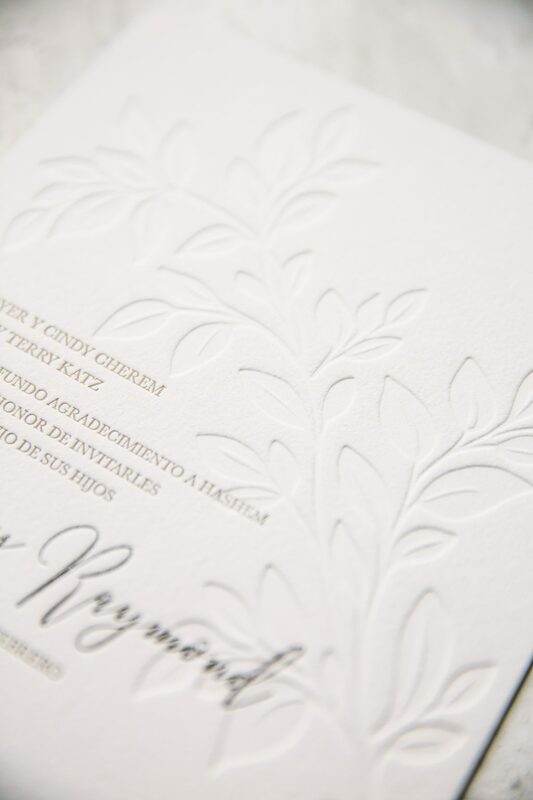 Becky and Raymond worked with Disenos Personalizados to create the botanical blind deboss wedding invitations. They paired the botanical motif with typography that is justified to the bottom left corner. 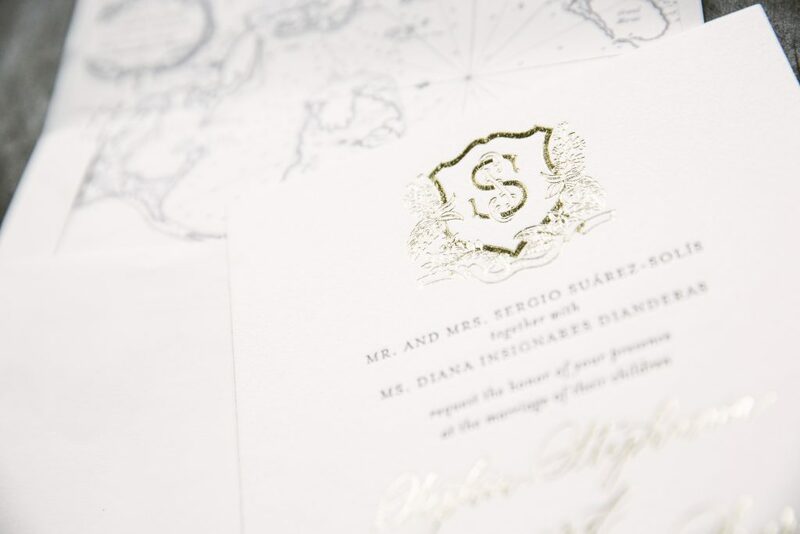 This allowing space for the textured motif to spread across the invitation. 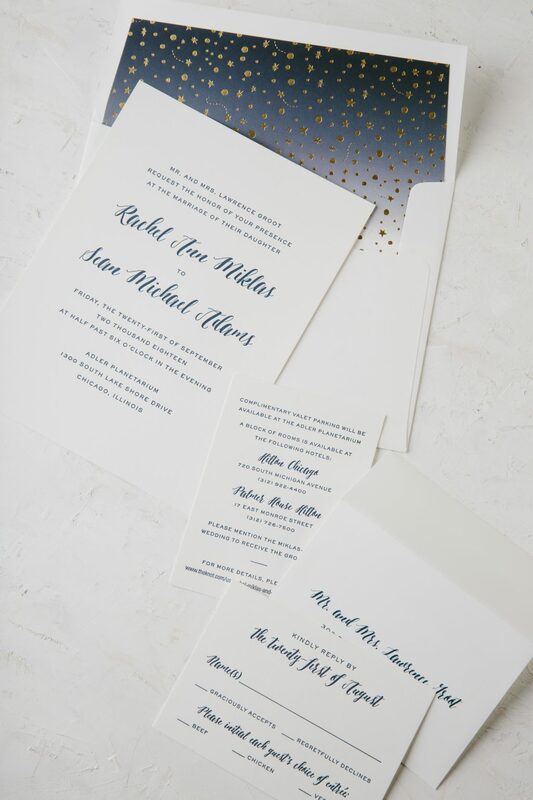 The name of the bride and groom printed in Platinum Shine created a metallic pop while surrounded by Desert letterpress. Finally, the set contains a metallic sand envelope liner to keep the overall color palette consistent in its neutrality.